If you like what you've read here, check out Megan's blog that she shares with her literary alter-ego, Caitlin Crews. You can also find her on Facebook and Twitter. MA: What was your favorite fashion fad/trend from the 80's? MC: I remember really liking to wear as many Swatch watches as I could fit on my arm. Why did I do that? I have no idea. I think I would also wear eight hundred Madonna-like black rubber bracelets on the other arm. I thought this was extremely cool in the eighth grade. MA: What is your funniest memory from growing up in the 80's? MC: Aren't all memories from the 80s kind of funny--and sad? I can't decide if I think the decade was so odd because it spanned the conscious part of my youth, or if it was universally ridiculous. I lean toward the latter. MA: What is one thing that you remember about the 80's that you think others would not remember so easily? MC: Well, all my personal drama, of course. Happily, that's all mine! MA: What was your favorite 80's sitcom? MC: The Golden Girls. I just loved them. MA: What is one thing from the 80's that you wish were still around today? MC: My youthful skin. I miss it so. MP: What is your favorite 80's song? MC: This is a hard question to answer. I think I have to go with "Save A Prayer" by Duran Duran for the sake of argument (although, really, there are so many choices). That one always works. Such a great song. One of the best things about writing this book was putting together my Eighties music playlist. It's amazing how many of those songs stand up today! MP: Which 80's movie could you watch over and over again? Why? MC: Any John Hughes movie. Or any early John Cusack movie. Why? Because they defined my teenaged life! 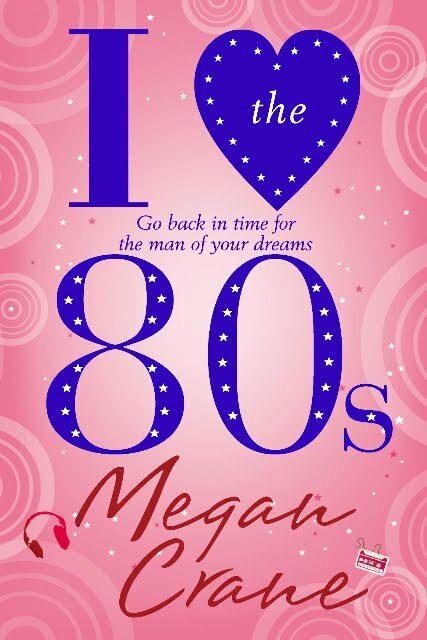 MP: What inspired you to write a book that is set in the 80's? MC: A while back, I ended up watching a bunch of 80s videos on YouTube. It was so much fun. I still know all the words to "Club Tropicana" and "Wham! Rap." I still get chills when "Save A Prayer" starts playing. How could you not? I wallowed in my long-dormant crushes on singers like Simon LeBon, Sting (circa Dream of the Blue Turtles), and George Michael. And I thought, what if one of them had died way back in the day, at the height of their glory? And what if one of the teenage girls who were So In Love With Them They Owned The Six Foot Poster and All the B-Sides grew up still loving them that much? And what if one fine night, that obsessed fan girl (now, say, in her 30s) found herself transported through time to New York in 1987 and got to meet this man of her dreams--who only she knew was destined to die horribly in just over a month? So, obviously, I had to write that book. MP: What was one of your favorite activities in the 80's? MC: My favorite thing to do in the 80s was to write my books in the black and white notebooks I carried everywhere. I wrote in class. I wrote at home. I wrote wrote wrote. It never occurred to me that anything would come of it. MP: What was your favorite toy, game, or doll in the 80's? MC: I had a couple of cabbage patch kids. And a pound puppy. (The stuffed animal.) I liked Glamor Gals. I always wanted all the Strawberry Shortcake dolls, but I never got them. Or Barbie. My mother was opposed to Barbie. It just occurred to me to wonder what happened to all those toys... Huh. Special thanks to Megan for answering our questions and taking everyone on a trip through time, as well as offering the books for the giveaway! 1. Please tell us: What is one thing from the 80's that you wish were still around today? 2. Please tell us: What is your favorite trend or fad from the 80's? One thing from the 80's that I wish was still around today was the music style. I love 80's music! 1. I wish big hair was still around - so ridiculous and so much fun! 2. I was really young during the 80s, but I loved wearing banana clips! Why haven't they made a comeback with the faux hawk craze????? 3. Already a follower of the blog and on Facebook. I wish that the original Strawberry Shortcake was still around. I didn't hit my teens until the 90s so I don't really remember any trends from the 80s. I love the music and the toys (I love that so many of them have become popular again). I am a member of CLC. Count me in to win! I don't remember much from the 80's because I was born in that decade, but watching movies like "The Wedding Singer" where all those wild trends were around makes me wonder what it would've been like to be a teenager in that time. 80's music! We need more of it! I used to dance around in my room in front of the mirror for hours! The music in the 80s was fabulous! I wish 80's Hair bands were still around. Gotta love the jean tight roll, or jam shorts, suspenders with one side unattached hanging in the front. HAHAHAH! I wish all the music from the 80s was still around. And, oh my god...Pound Puppies!!! And My Little Pony!! Seriously, I really love the 80s. Favorite trend was krimped hair. And mall bangs. My favorite trend from the 80s was the big bulky t-shirts or sweaters with leggings. Most comfortable outfit ever! I was an 80s baby, so I enjoy watching the movies, but I didn't really follow the trends as I was just trying to learn to walk and my ABCs. I am loving some of these. My Little Pony, Pound Puppies OMG! I remember the jelly shoes and bracelets. I had a ton of them! Hi there, I've got this posted at Win a Book for you. No need to enter me. I wish there were more movies like the ones from the 80's! Leg warmers were probably my favorite fad! i have a lot of favorite music from the 80s so it would really really be awesome to hear them again! The fad I loved from the 80's was gloves. I had Madonna's lace gloves and a Michael Jackson sparkly glove. I had the best pair of freezy-freaky gloves too. I loved the 80's sitcoms. I follow facebook and twitter. I miss the TV shows! 1. I miss the music so creative, the clothes, no no, the clothes no. My naivety, all was NEW and funny for me, everything interests me. 3.I'am follower of Chick Lit Central: The blog. I miss John Hughes movies and cassette singles. Leggings and big shirts. Forgot to add I posted it on FB. I wish MTV was the way it was in the 80s! I miss the 5 original VJs, Friday NIght Video Fights, Guest VJs, all the endless videos. I think MTV should air blocks of video from that time on one of their classic channels. That would make my day. I loved Swatches! I want to bring them back in style! Why not? Already a member of Chick Lit Central on Facebook! I wish for 80's music to come back! Style or trend...definitely big hair!! And leg warmers! Hmmm, leg warmers? To be honest, I don't miss much from the '80s, but it's always fun to look back on them. Already a Facebook and twitter follower. Ooooh, would love to win this since I'm the ultimate Gen-Xer and have been wanting to write a Gen-X novel! It's interesting to see how some of the 80s trends have made a comeback, like baggy plaid shirts w/ big belts and spandex pants and boots, studded belts and bracelets, etc. And if you're as notorious a Duran Duran fan as me (sorry, I couldn't resist! ), check out their new album -- it's both modern and retro, a bit reminiscent of Rio! Best of luck with your novel, Megan, and congratulations! And my fave thing about the 80's, even though I was a baby, the outfits and the pop music. Love it!! I loved the music - so many memories! Wore hip belts with long shirts over here in the UK. Will follower the blog and post to FB. Am a member of CLC too! 3. I am a follower of this blog. 4. I shared the link to this contest on my facebook page. The one thing I loved about the 80's was the simplicity of everything for teens and younger kids. Yeah, technology is great and all, but now kids have cell phones, iPods, computers, ..........too much electronic stuff. What about Barbies, doll babies, playing house, hot wheels, and so on. Kids are growing up too quick. Geez......now I sound like my parents! My fave trend was skinny jeans, ankle zip jeans, hi-top Reeboks, and Seventeen Magazine.